Photodiodes, or photodetectors, are key components of fiber-optical broadband networks: they convert light to electrical signals. The inability to efficiently fabricate these detectors directly onto silicon chips has hindered faster broadband speeds thus far. Using thin films of germanium and silicon, a research team at the A*STAR Institute of Microelectronics has developed an ultrafast photodetector that may overcome this problem. This detector can be deposited on a chip using a cost-efficient thin-film deposition, or 'growth', process that is compatible with electronic components, according to Ning Duan from the team. 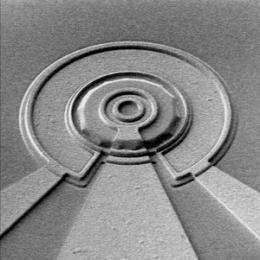 The realization of such detectors is a key step towards processing fiber-optical signals on a silicon chip. Duan and his co-workers developed their photodetector—known as an avalanche photodiode—using one of the fastest photodetector designs available. The device is made from semiconductors that operate under an applied electrical field at high voltage. In this field, arriving light excites electrons. They gain so much energy that it leads to an 'avalanche' of electrons, which can be easily detected. Since silicon is not suitable for infrared light detection, the related element germanium is typically used instead. Duan and his co-workers succeeded in depositing germanium thin films on silicon by developing a so-called epitaxial process. During the deposition of the silicon and germanium layers, electrical conductivity was enhanced by selectively implanting into the films atoms from other elements such as arsenic and boron. The deposition worked at only a few hundred degrees Celsius, which is low enough to be compatible with industrial silicon fabrication techniques. The detectors fabricated from these structures (see image) are designed for operation at wavelengths of around 1,550 nanometers, which is the spectral region used in telecommunications. Compared to a normal germanium photodetector, the avalanche design has enhanced the detected signal by a factor of 30. The gain-bandwidth product, which characterizes both the detector enhancement as well as operation speed, is as high as 310 gigahertz. This level is twice that of the traditional avalanche photodetectors based on compound semiconductors such as gallium–arsenide. Further research is needed so that these detectors can be integrated with other electronic components on the same chip. A transimpedance amplifier, which converts electrical current from the photodetector into an electrical voltage, is an important component still lacking on the chips, says Duan. "We are working on transimpedance amplifiers that can match the performance of these photodiodes in order to achieve a good overall sensitivity of the circuits."